My daughter in law read this to her children from birth. Every night. They are 16 and 18 now. Hurricane Katrina came and in fleeing from the rising water, their mother was killed. We did not get her body back until Nov. 18. All this time we have been searching and grieving. 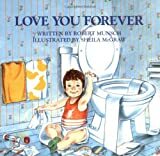 For the memorial service my granddauther wrote the euolgy and started it with “I’ll love you forever / I’ll love you for always / As long as I’m living / My baby you’ll be.” My mom read this to me every night etc. And at the end, with everyone crying and hearts breaking, she read “I’ll love you forever / I’ll love you for always / As long as I’m living / My mommy you’ll be.” When she went to the flooded house recently she found the book, wet, nasty with mud, but she found the book she treasured to remember her mom. This little classic is readily and easily digested by one who has known the true love of a mother. My mother gave me this book during the first Christmas with my new baby daughter in 1992. I had no idea that within the year, my father would be gone, and I would begin to give tender care to my precious little mother who would begin “getting very sick” much like the mother in the book. I cried a bucket of tears as I read it aloud with my wife, mother and father for the very first time. When my mom passed on, it was a tender and precious time at her bedside, and very reminiscent of this tender little book. Today, my two girls go for it regularly on my shelf at bedtime. They tease me because I can’t get through it without crying. Funny to me that they have a very good grasp of allegory and they, unlike some of the book’s critics, understand that the scenes with the mother coming to the man’s apartment are actually his memories of her love. They understand, as I explain to them that the love poured into the son by his mother, has taught him how to love his new baby daughter at the end. Love begets love, and this little childrens’ parable is a powerful reminder! I highly recommend _Love You Forever_ to anyone who enjoyed a wonderful love with their mother. To others, I’m sorry but you simply won’t (and obviously don’t) understand. It’s not written for you.